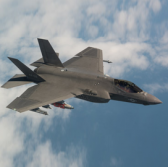 Lockheed Martin has resumed deliveries of F-35 fighter jets to the Defense Department after both parties addressed differences over aircraft repair costs, Reuters reported Tuesday. The Pentagon’s F-35 joint program office told Reuters that DoD stopped accepting F-35s in late March due to a disagreement on who should be financially responsible for a production quality issue that was discovered in the latter part of 2017. JPO added that Lockheed, the U.S. military and international customers will collaborate to carry out necessary repairs. The company aims to deliver 91 F-35s through the end of this year.